'English votes for English laws' (EVEL) has not enhanced England's voice in the UK parliament, according to a 12-month study joint published today by the Constitution Unit. The study concludes that "greater attention should be paid to the challenge of enhancing England's voice in the UK parliament". 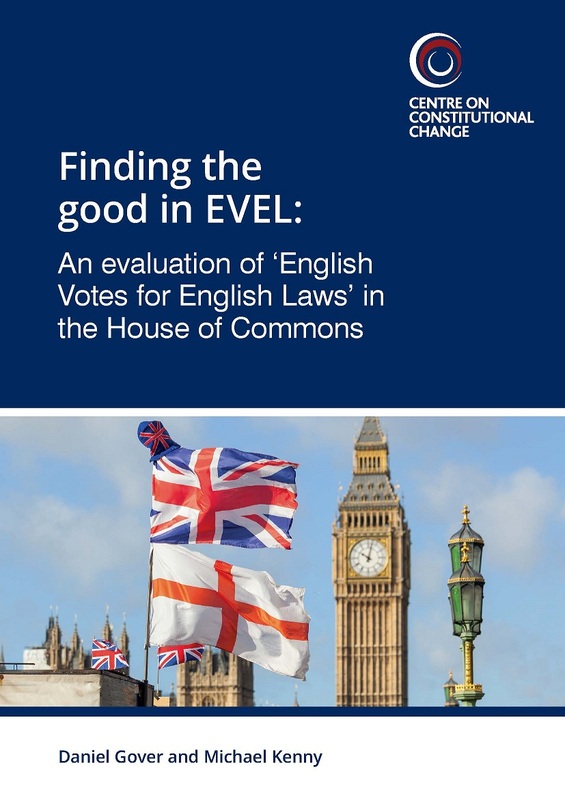 Finding the good in EVEL: An evaluation of 'English Votes for English Laws', written by Professor Michael Kenny and Daniel Gover from Queen Mary University of London's Mile End Institute, is the first in-depth analysis of how EVEL has worked since its introduction in October 2015. It is published today by the Centre for Constitutional Change with the support of the Economic and Social Research Council and the Constitution Unit. The EVEL procedures, introduced by David Cameron after the Scottish independence referendum, respond to the so-called 'West Lothian question'. They give English (or English and Welsh) MPs the opportunity to veto entire bills, or clauses of bills, that relate exclusively to that part of the UK. They do not however provide English (or English and Welsh) MPs with sole control over English (or English and Welsh) legislation, and do not change procedure in the House of Lords. Currently, English stages are held at the end of a bill's Commons passage, when most scrutiny and debate has already taken place. The report finds that there has been almost no interest in these English stages in their current form, with most lasting around two minutes. The report makes several recommendations for reform. These fall into four categories: doing more to facilitate expression of England's 'voice' at Westminster (as opposed to simply a veto right); applying more consistently the 'double veto' that is central to the government's reform; reducing the complexity of the system; and taking steps to improve its legitimacy. The authors recommend that the House of Commons should consider introducing a cross-cutting English Affairs select committee as a forum for debating and scrutinising English issues. The report says that a forum such as this might help show that England's interests are being voiced and heard at Westminster. The report suggests that while the current version of EVEL is flawed, it has avoided most of the problems predicted by its critics. The authors conclude that EVEL "can be justified as a pragmatic response to devolution to other parts of the UK."